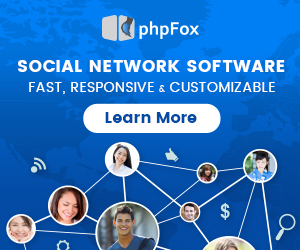 Great news for all phpFox Affiliates! You can now have a chance to increase your commission from 20% to 30% for every product purchase from your referrals. What a sweet deal! You just need to have three successful referrals within a month. Once your referrals successfully purchase a phpFox license, we will increase your commission to 30% from the succeeding month onwards. In addition, we also publish many pre-designed banners so that you can put them into your marketing materials. Recently we attached two banners from the article phpFox Affiliate – How it works? And to make your posts more effective, we created new banners with different sizes that you can use in your marketing campaign. A bigger version of the leaderboard banner that is perfect to place on top of your sites or in forum websites. This banner is usually placed at the top of a page, so as to be seen by the user immediately when the page loads. This banner is perfect to place at the top of a page, in the same spot occupied by leaderboards. It is often used twice on a page, with two banner ads appearing side by side to span the width of the page. This banner is commonly placed above the fold or the viewable space on a webpage when it first loads. You can use this banner as an alternative for the medium rectangle banner to fit on the page better. The 160×600 banner is generally placed on the side of a page, so as to show users an ad as they scroll down the page. A smaller version of Wide Skyscraper that can also be placed on the side of the page. You can download these banners now and use on your sites, forums, or any page of your choice. Just make sure to use your unique referral link when using these banners. How to become a phpFox Affiliate? Everyone is welcome to join our Affiliate Program. You can earn 20% commission by default for selling phpFox licenses. Moreover, you can earn up to 30% commission once you sell three licenses in a month. How cool is that? You can also read the articles about phpFox Affiliate – How it works? 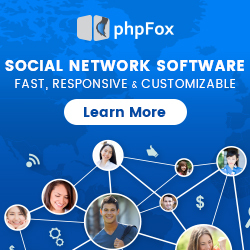 and Earn Money in phpFox Affiliate Program for more information. Register now at https://www.phpfox.com/affiliate/ to get started.